I just can't seem to pull myself away from this book, The Modern Baker" by Nick Malgieri. I've been posting recipes on and off for probably 2 weeks now and I keep finding new ones I want to try! 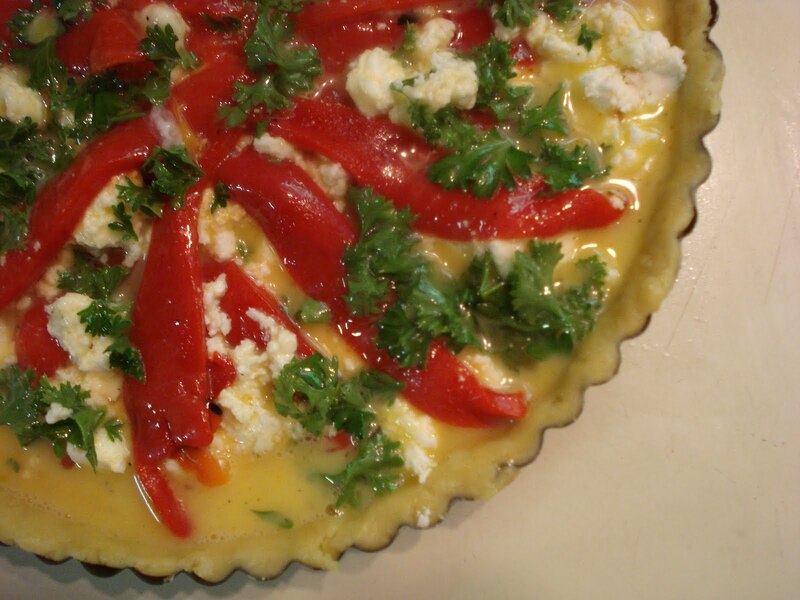 This beautiful tart uses goat cheese and one of my favorite things, roasted red peppers. 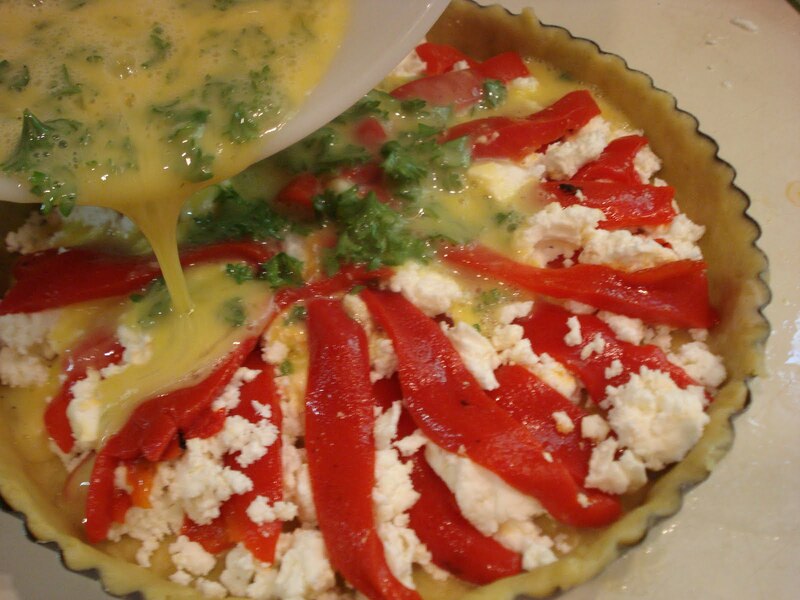 The original recipe calls for any color pepper which he says is fine for this tart but the red and yellow ones are sweeter than the green ones. The crust is, for me, a bit unusual. It is an olive oil dough. It's easy to make and rolls out beautifully because it uses oil rather than butter. I made a few changes in the recipe. For one thing, I have regular parsley growing in my backyard garden so I used that instead of the flat leaf parsley called for in the recipe. I also only had 8 ounces of goat cheese. The original calls for 10 ounces, which to me is an odd amount as I only see goat cheese in the supermarket in 4 ounce sizes and this would mean buying 3 packages. Being somewhat of a frugal cook, I wouldn't have wanted to buy a third container. The cheese is a bit pricey!). 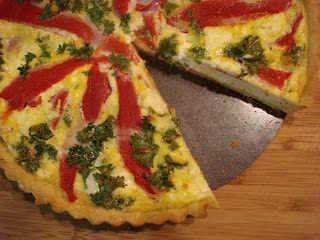 The goat cheese I used, however, was from the same farm, Flint Hill Farm, that I get at my farmer's market. One last mention, and this is an important note. 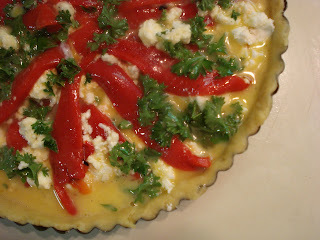 I did really love the flavors of the peppers with the goat cheese in this tart. 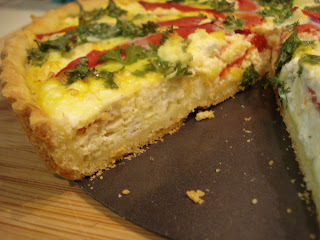 And I'd love to make the olive oil crust again. Hmm..let's see..maybe some ricotta and a pesto basil or caramelized onion and olives, or how about spinach, mushrooms and sun dried tomatoes...or..
To make the tart dough, combine the flour, sugar, salt and baking powder in the bowl of a food processor and pulse several times. 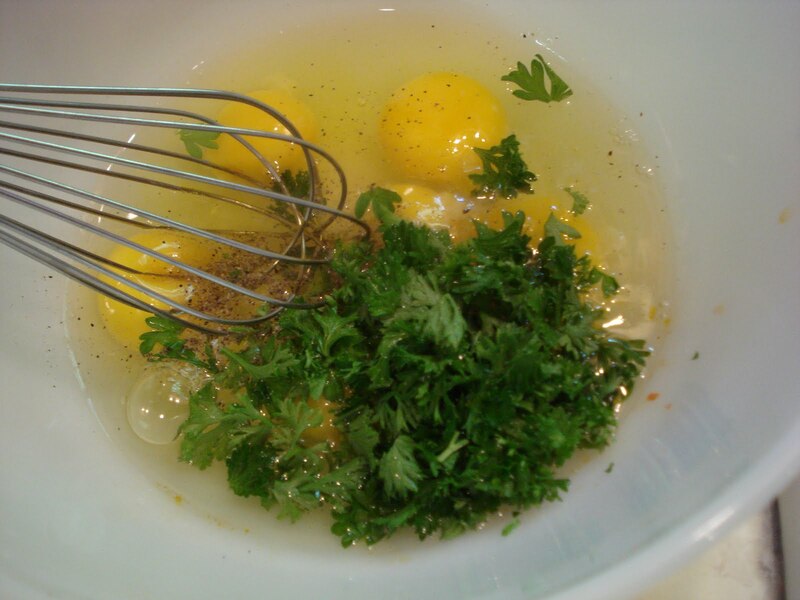 Place the oil, egg, egg yolk, and water in a small measuing cup and whisk with a fork to break up the egg and yolk. 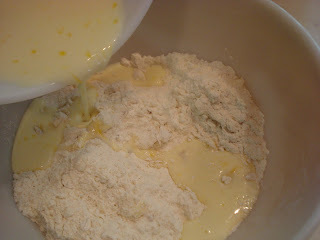 Add the egg/oil mixture to the flour mixture pulsing repeatedly til the dough forms a shaggy ball. 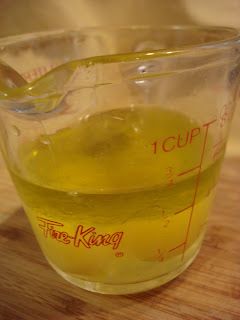 Don't overmix or the oil might separate from the dough and make it impossible to handle later on. ( His words, not mine). I say just undermix slightly and you'll be fine! As you can see from the photo below, mine looks more like a curdled mass, rather than a shaggy ball! Press the dough into a roughly 1/2" thick disc without folding it over on itself. 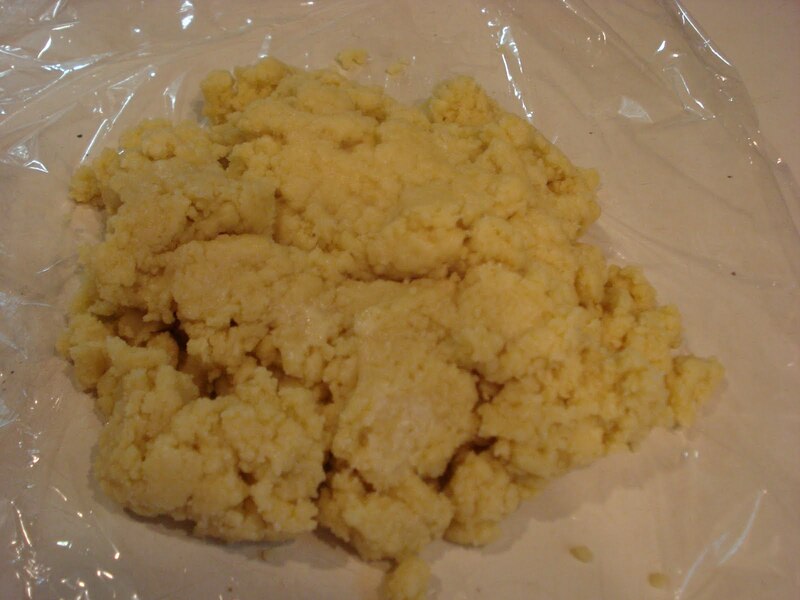 Roll out the dough either on a floured surface or between 2 pieces of plastic wrap or waxed paper ( or you can refridgerate til needed. It will keep in the fridge for several days. Sure..while you make those roasted peppers!). Roll it to the size you'll need for your 10" or 11" tart pan. Then place the dough into the pan. See my cheater red peppers? I cut them into strips. Sprinkle the half the goat cheese onto the unbaked crust. Then place half the pepper strips on top. 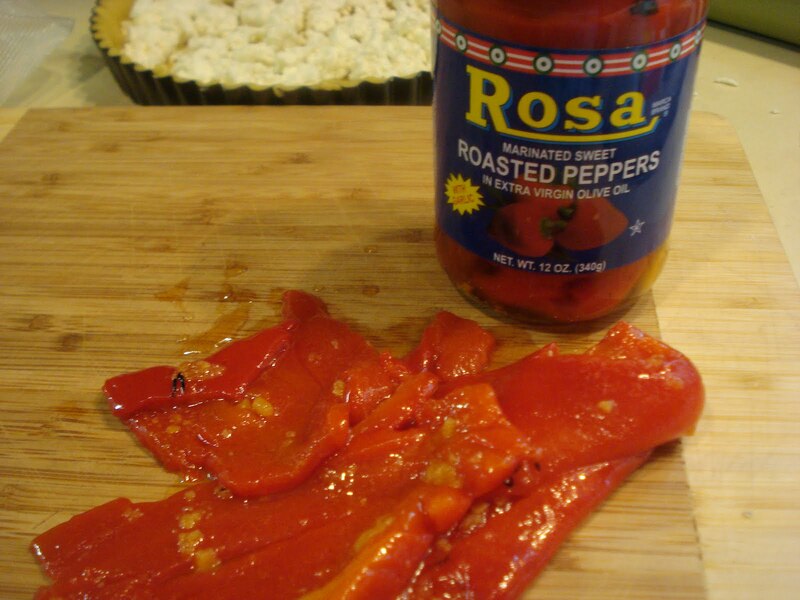 I thought it would make cutting easier to place the peppers this way. 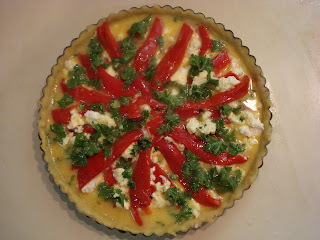 Then repeat with the other half of the goat cheese and peppers. And pour onto the crust. Bake the tart til the filling is set and well colored and the crust is baked through, about 30 minutes. It will look a little underdone in the center but it continues to cook a little and set up after you take it out of the oven. Preheat oven to 375. Set a rack on the lowest level of the oven. 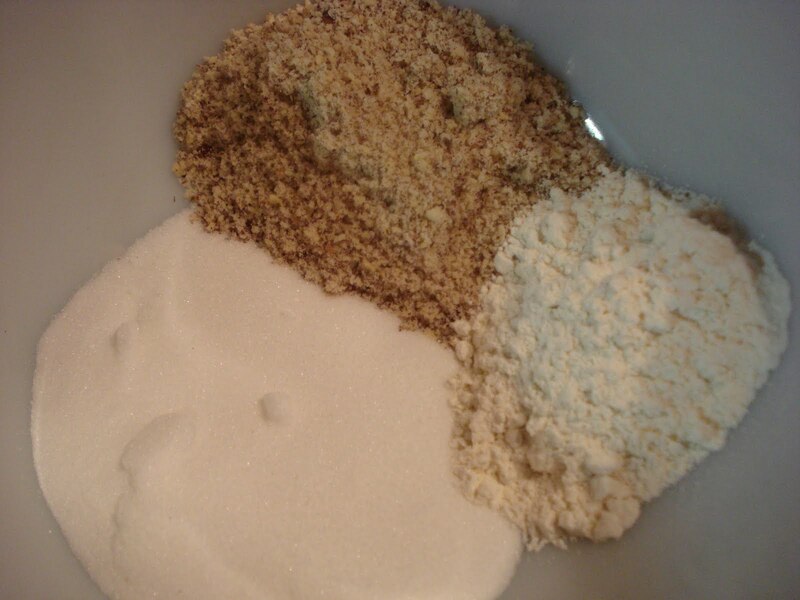 1.Place the flour, sugar, salt and baking powder in a food processor and pulse a few times to combine. 2. Mix the oil, egg, egg yolk and water in a small measuring cup and whisk with a fork to break up the egg and yolk. 3. Add the egg/oil mixture to the dry and pulse repeatedly til dough forms a shaggy ball ( see my notes above). 4. Dump the mixture onto a floured work surface ( or on plastic wrap) and press into a 1/2" thick disc. 5. 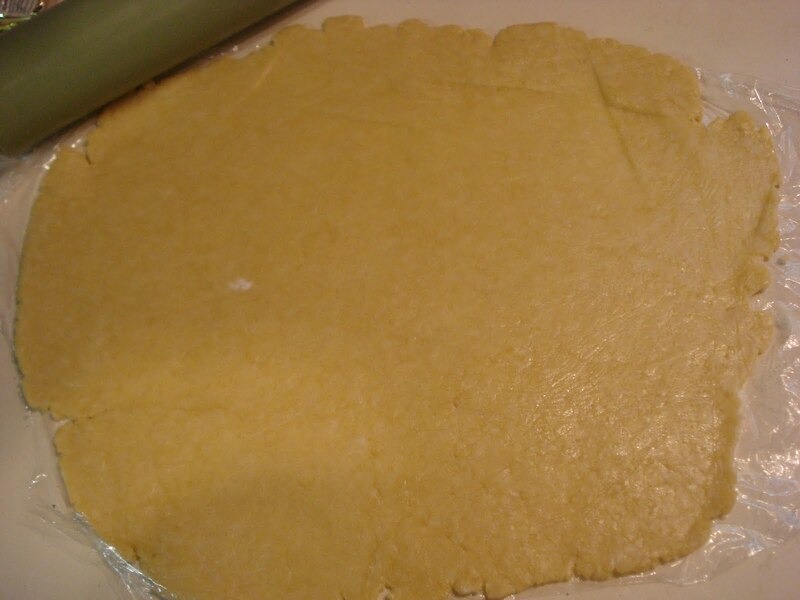 Roll out the dough to fit a 10" or 11" tart pan and place dough into pan. 6. 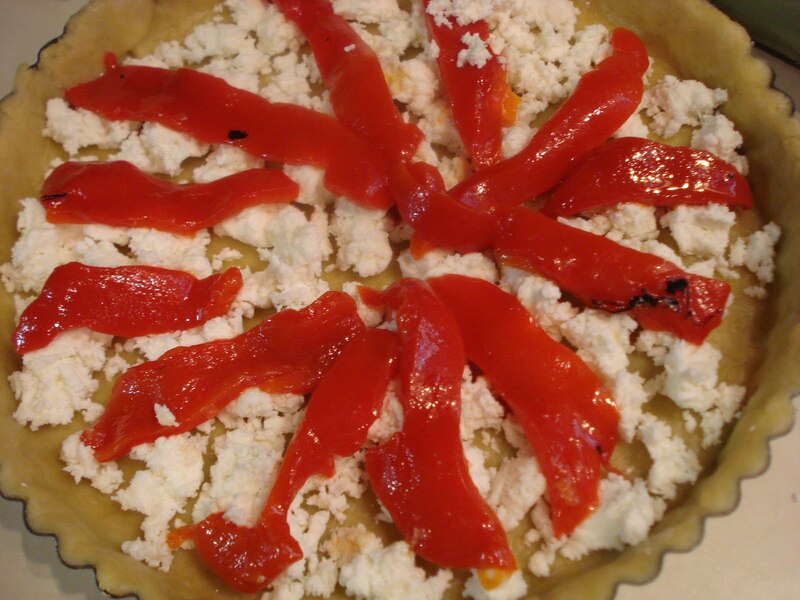 Sprinkle half the goat cheese onto the dough, followed by half the peppers, then repeat using the remaining half of the goat cheese and peppers. 7. 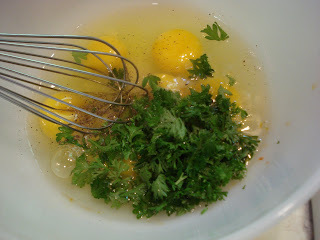 In a small bowl, whisk the eggs with salt and pepper and parsley and pour the mixture into the crust. 8. Bake the tart til the filling is set and well colored and the crust is baked through, about 30 minutes. Careful not to overbake the tart. The filling will look a little underdone but it will continue to bake after it comes out of the oven and set up as it cools. Cool on wire rack. 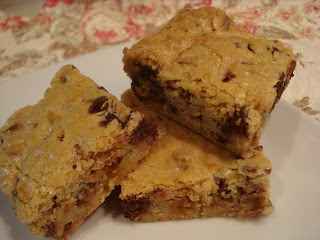 I noticed this recipe for a chewy chunky blondie floating around the internet recently and although I'd like to think I have a really great blondie recipe, I can never resist trying another, especially if it's one from Dorie Greenspan. You just know it's going to be good! I make blondies quite often for the Farmer's markets and it's interesting to note that there are still so many people, around here anyway, that don't know what a blondie is. Once they take a sample bite though, they're hooked! My recipe is made without using the standing mixer but, even though this one does use a mixer, it's still a quick and easy dessert. As far as the add - ins go, I think you can just about add in anything you like.. and leave out anything you don't. For example, if you don't like coconut, leave it out. As I've said before, toasting it, I think, helps cut some of the chewiness that a lot of people don't like. For the nuts, I used pecans rather than walnuts. This blondie is moist, which you'd expect from a blondie, and it has the right amount of sweetness. 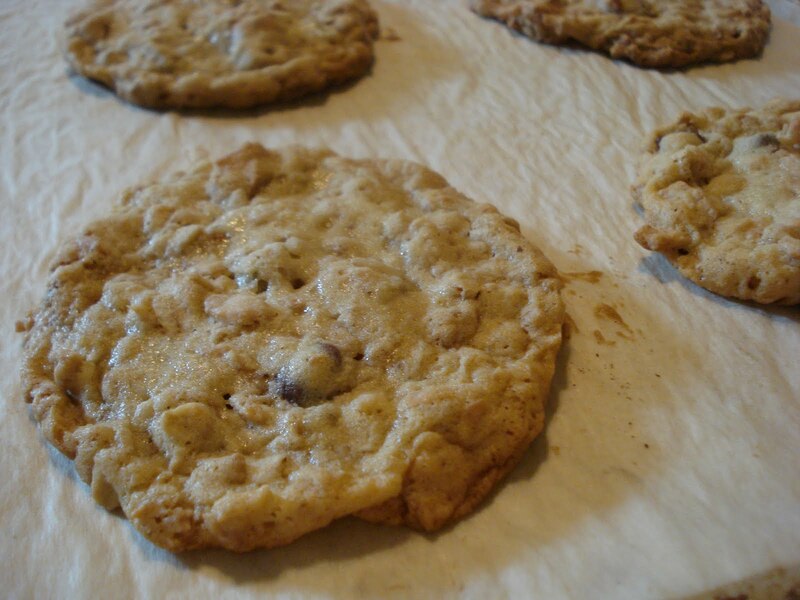 I love the crunch from the nuts and the butterscotch chips adds a caramel flavor. As usual, I halved the recipe and used an 8" x 8" pan. Preheat oven to 325. Lightly spray a 9" x 13" pan and line with heavy foil, extending the foil on 2 sides to allow you to lift out, once baked . 1. 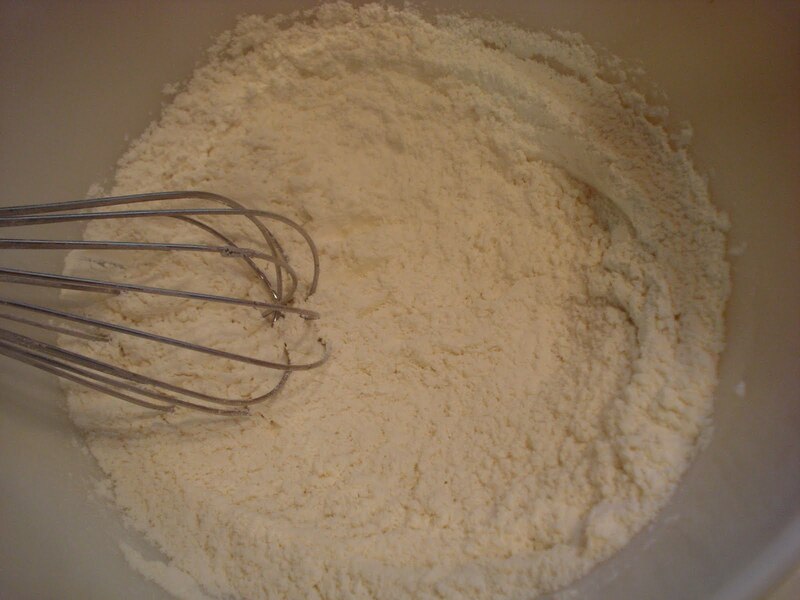 Whisk flour, baking powder, baking soda and salt in a medium bowl. Set aside. 2. 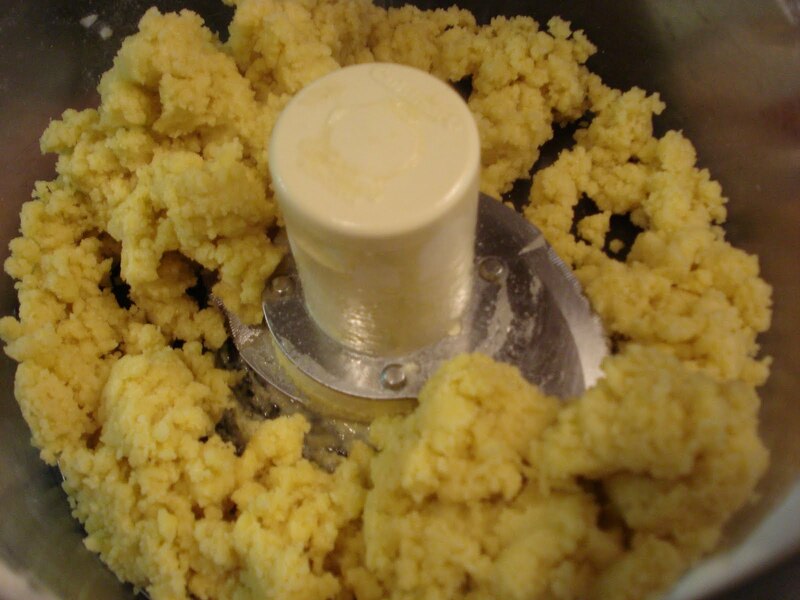 In a mixer bowl, beat butter til smooth. 3. Add the sugars and beat about 3 minutes. 4. Add eggs, one at a time, beating one minute after each addition. 6. 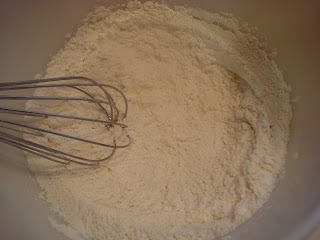 With mixer on low speed, add in the flour mixture. 7. Using a rubber spatula, stir in the add - ins. 8. 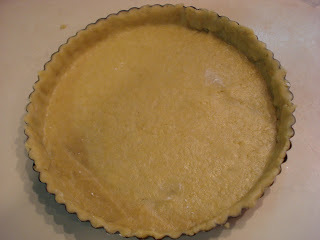 Bake 40 minutes or til a knife inserted in the center comes out clean and the sides are pulling away. 9. Cool in the pan approx. 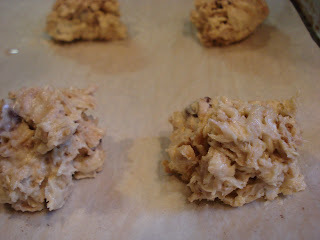 one hour, then, using the foil, lift out the blondie and cut into serving size pieces. 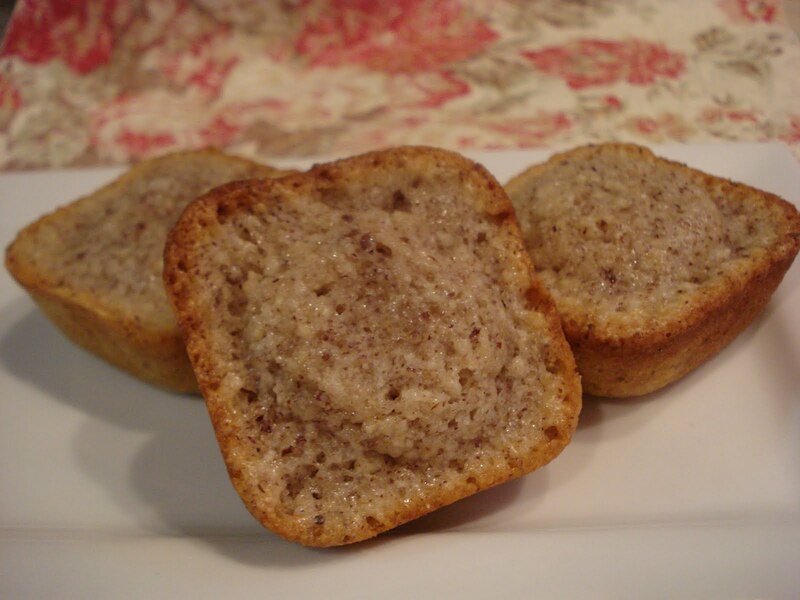 Ever since I started flipping through Nick Malgieri's book, "The Modern Baker", I have been avoiding his recipe for these small individual hazelnut cakes which are also known as financiers or friands. 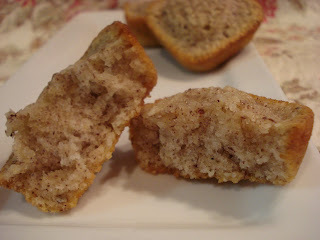 You see, I tried making these a few weeks ago, well, no, I actually did make these a few weeks ago from another recipe I found online..but they came out kind of gummy and not really like a little cake I had high hopes for! Since I was not familiar with this cake, having never tasted it, much less tried baking it, I didn't really know how it was supposed to turn out. I only knew from reading the descriptions of the different recipes that it sounded like it should be light and moist. And another thing, some recipes say to beat the egg whites before adding to the other ingredients and some don't mention beating them at all. How confusing! This particular recipe doesn't say to beat them so I just added them into the dry ingredients. So in a weak moment yesterday, I tried the recipe in this book and, finally, I was very happy with the results! This little cake turned out to have all those previously mentioned qualities..moist, light and with the flavor of hazelnuts, it could do no wrong! Butter and flour your muffin pan or friand molds first and set aside. Place the flour, ground hazelnuts and sugar into a large bowl. 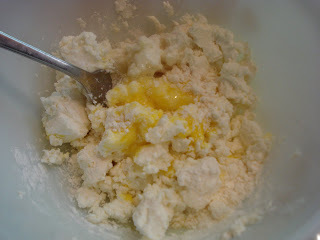 Then stir in the egg whites, unbeaten, and then fold in the melted and cooled butter. 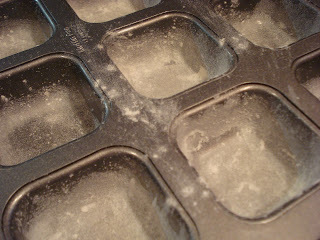 Spoon the batter into the individual muffin pans or molds ( if you're extravagant enough to have friand molds!). Again, mine didn't make it to 2/3 full capacity. More like half full. Preheat oven to 375. Butter and flour your muffin pans or friand molds. 1. In medium bowl, combine finely ground hazelnuts, sugar and flour. 2. Using a large rubber spatula, stir in the egg whites. 3. Fold in the melted and cooled butter. 4. Spoon the batter into prepared pans, filling them about 2/3 full. 5. 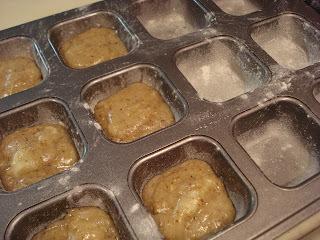 Bake the cakes until they're well risen, deep golden and firm when pressed, about 15 minutes. 6. Invert them to a wire rack to cool, then immediately turn them rightside up to cool completely. Storage: Keep cakes loosely covered with plastic on the day they're made. Or for longer storage, refridgerate, in a tin or plastic lidded container. Bring to room temp. before serving. 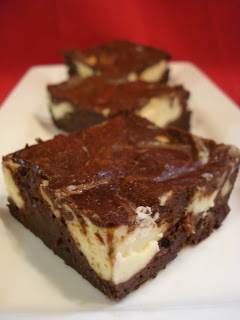 I've been dying to try a recipe using chevre in a brownie ever since I watched the Throwdown episode with Bobby Flay vs. 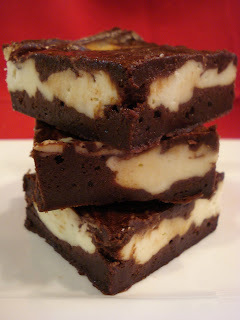 The Vermont Brownie Co.
Last week I got some more chevre from a local farm, Flint Hill Farm. They set up at the same Farmer's Market I do on Saturdays. Rebecca was kind enough to give me some of their goat cheese..well, we sort of barter..cookies for cheese! A great deal all around! So I made a batch using this recipe but after I made it I realized it uses canola oil rather than butter. ( I know..duh! I didn't realize this til I had them in the oven!) 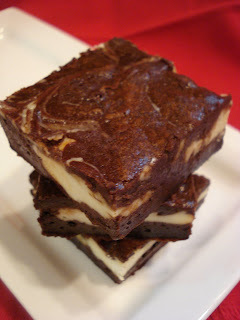 The brownies came out really pretty good but I wanted to make a nice chocolatey rich brownie using butter so I chose the brownie recipe Bobby Flay made for the Throwdown, not using his peanut butter filling, of course! (I did omit the 2 ozs. of chopped bittersweet chocolate that he adds to his recipe. I didn't want any chocolate chunks in my brownie but if you do, just add it in.) I used the chevre filling from the oil brownie recipe, however, because it was really good. The tangy taste of the chevre with the not overly sweet chocolate brownie is a really great combination. 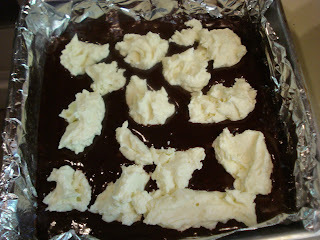 Please note: I halved the recipe because I only had enough goat cheese to make half and I baked mine in an 8" x 8" pan. The recipe I am giving you is for this halved amount. Since I didn't make the full size recipe, I didn't want to just give you the recipe for the full amount as I felt maybe it would turn out a little differently from mine. Let the brownies cool completely in the pan, then lift them out of the pan with the foil and place them in the fridge to get nice and cold before you cut them. It's so much easier to cut them cold. I think the flavors really come out after a day ( I made them last night) and when they're at room temp. But, hey, some of you like cold brownies and that's okay with me! Just try them though. They're that good! And..yes! they were sure fun to photograph! I had trouble deciding which one of these 3 photographs to use...so I just used all 3! Which picture is your favorite? Do any of them want to make you want to take a bite? Start by making the chevre filling. Take your chevre out of the fridge and let it come to room temp. so it softens. Then mix it with the powdered sugar, egg and flour. Then beat it with a fork or whisk til it's nice and smooth. If it's still a little thick, add a teaspoon of milk. Set it aside, on the counter, while you make the brownies. 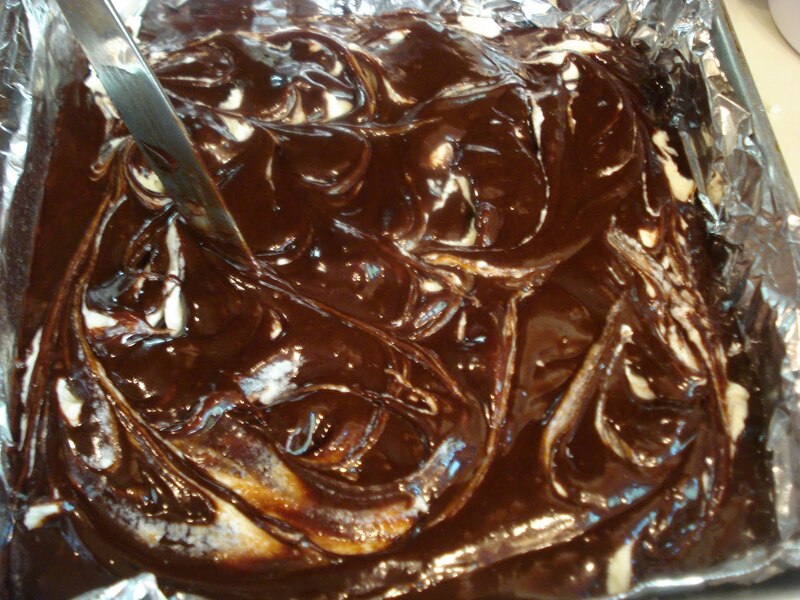 Over barely simmering water, double boiler style, melt the butter, unsweetened chocolate, 1 oz. bittersweet chocolate and espresso powder, stirring occasionally. Once melted, remove from the heat and let it cool down. In a large bowl, whisk the eggs, both sugars, vanilla and salt. 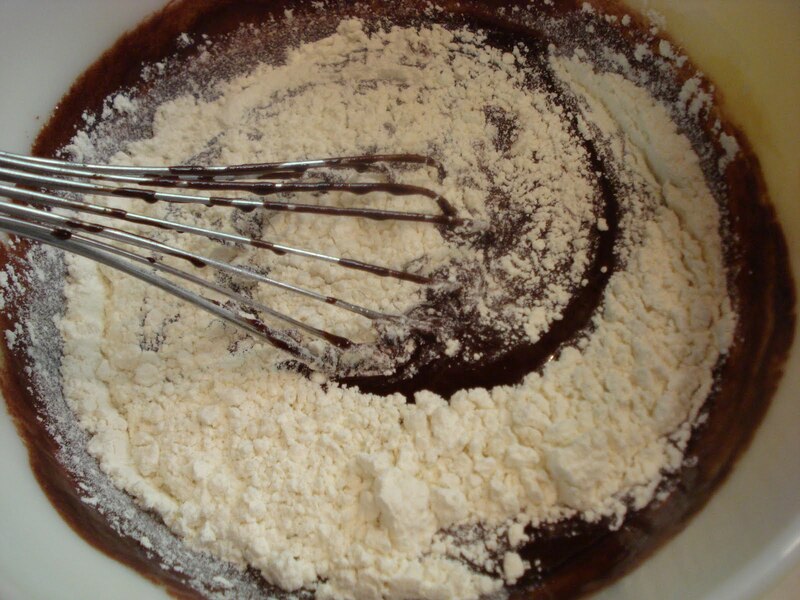 Whisk in the melted chocolate mixture. Beat in the flour in 2 additions. Stir in the remaining 2 oz. of chopped bittersweet chocolate ( if using). Spoon half the batter into a prepared pan and drop dollops of chevre filling on top. 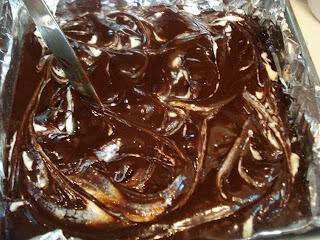 Spoon the rest of the batter over top and, using a knife, swirl the filling with the brownie mixture. Bake about 23 minutes or til the top is set but still a little soft. Insert a toothpick into the center. It should come out with a few moist crumbs. Place the pan on a wire rack to cool completely, then lift out of the pan and chill to make cutting easier. 6 oz. chevre, room temp. 1 tsp. milk ( if the mixture seems too thick). Preheat oven to 350. Line an 8"x 8" pan with foil, allowing extra to overhang on sides to lift out brownies. Spray foil lightly. 1. In a small bowl, beat the softened chevre, powdered sugar, egg and flour til smooth. If the mixture seems a little thick, add a teaspoon of milk. 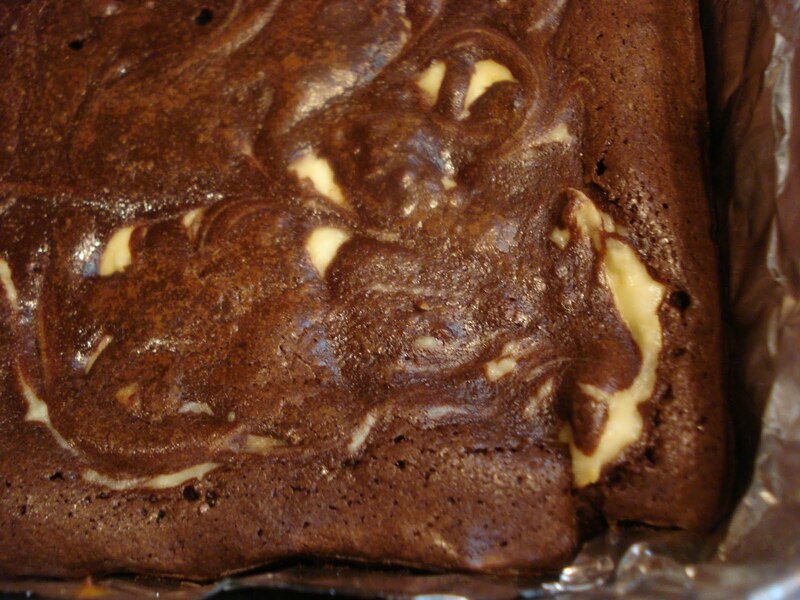 Set aside while you make the brownie base. 1. In a double boiler, melt the butter, unsweetened chocolate, 1 oz. of bittersweet chocolate and espresso powder, over very low simmering water, stirring occasionally. Set aside to cool 5 minutes. 2. 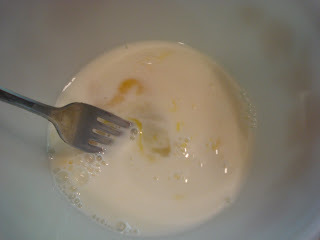 In a medium bowl, whisk the eggs, both sugars, vanilla and salt. 3. Whisk in the cooled melted chocolate mixture. 4. Beat in the flour in 2 additions. 5. Stir in the 2 ozs. of bittersweet chocolate , (if using). 6. Spoon half the batter into the prepared pan. 7. 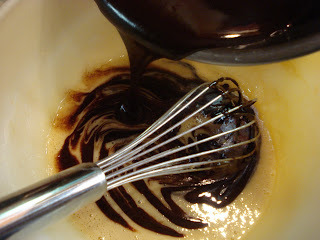 Spoon dollops of chrvre filling on top, then spoon remainder of batter over top and swirl with a knife. 8. Bake for 23 to 25 minutes, or til a toothpick inserted in the center comes out with a few moist crumbs and the edges are puffed. 9. Cool brownies completely in pan on a wire rack, then place into the fridge to get nice and cold, making it easier to cut pieces. I'm still working from Nick Malgieri's book "The Modern Baker" and this time I've chosen a scone recipe. 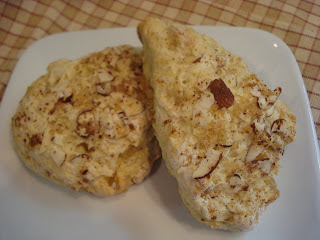 I make lots of scones each week for the Farmer's Market but I always like to try someone else's recipe. Kind of helps reassure me that my scones are really pretty darn good! I changed the technique for making these scones a little bit. I just went back to the procedure I use all the time since I have that pretty down pat by now! 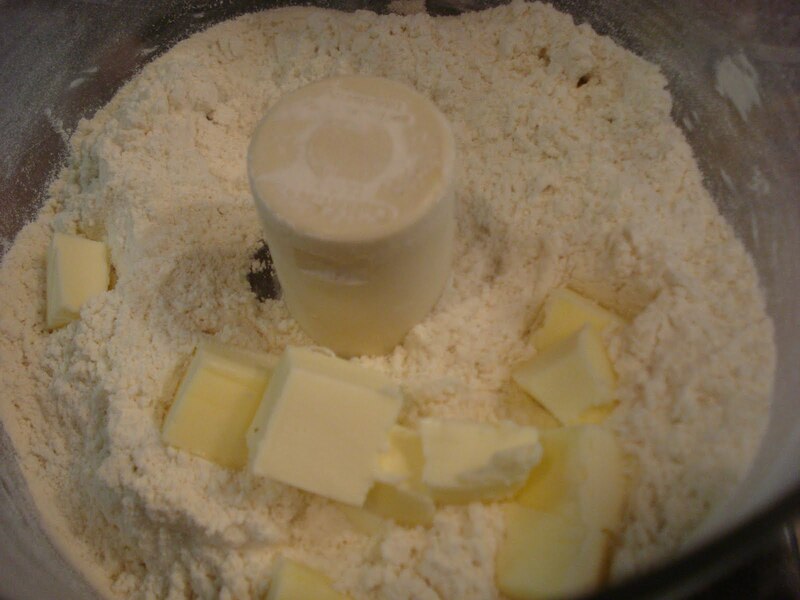 Instead of mixing everything in the food processor, I mix just up to and including the butter stage, then I transferred the dough to a bowl and mixed the wet into the dry ingredients with a fork, then a spatula. I also used a different method for the topping. Other than that...it's the same! They really are a nice tender and light scone and I love the little taste of cinnamon with the ginger. I sprinkled some raw sugar on the top, too. 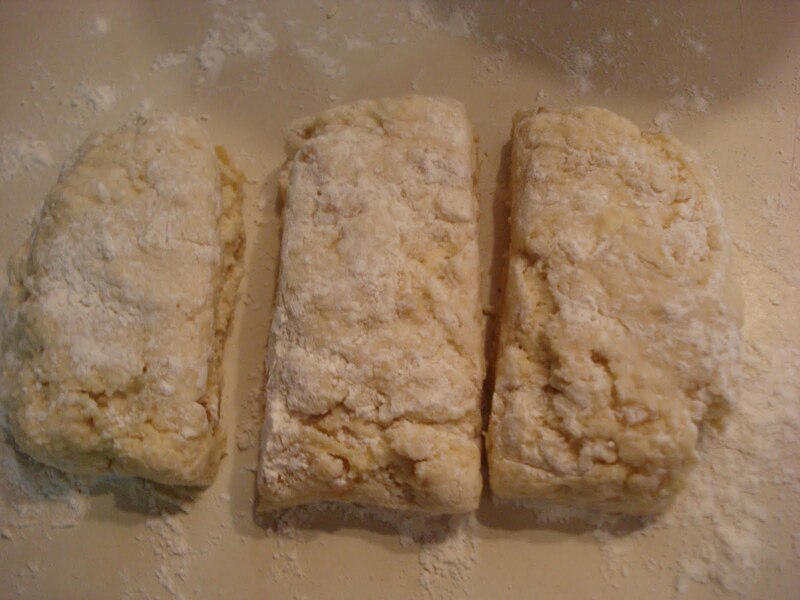 I halved the recipe ( which makes 9 scones) and I made only two today and froze the rest to bake at a later time. Freezing them makes it so convenient to be able to have them ready to bake whenever you feel like a few. You'll just have to add more time to the baking. 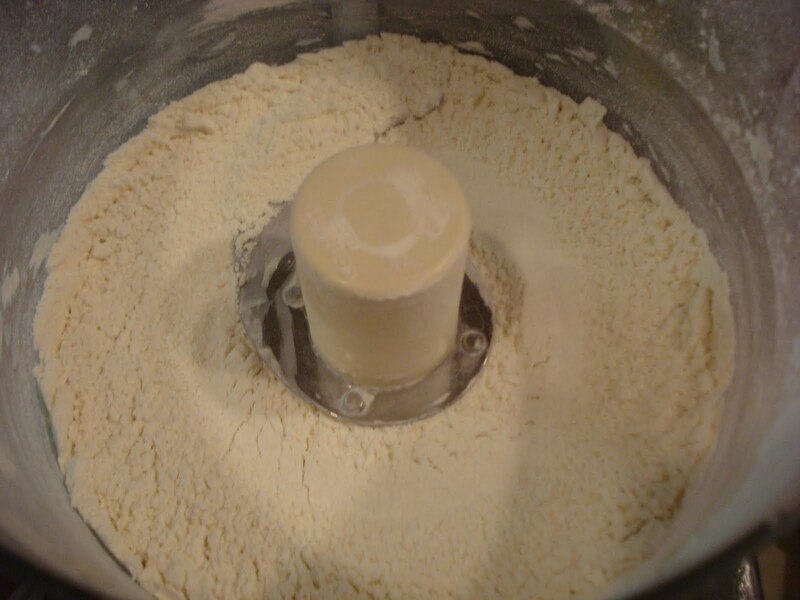 Begin by placing the dry ingredients into the bowl of a food processor. Give that a pusle to mix everything. Add the pieces of butter and pulse a few times to break up the butter into smaller pieces ( the size of peas..as they say!). Then ( and this is where I changed the prodecure), transfer the dough into a large bowl and add the crystallized ginger pieces. 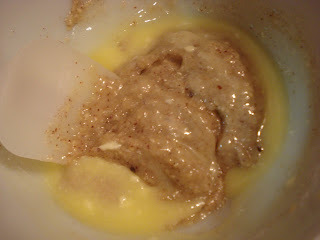 Add the wet ingredients to the dry (butter) mixture. And using a fork first, mix it gently, almost in a folding motion, scooping the mixture from the bottom and bringing it up and over the top. Mine needed more milk so if yours seems a bit dry just add more milk about a tablespoon at a time til it gets a nice, fairly moist and sticky look. Just be careful not to overmix the dough! 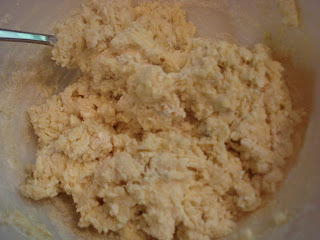 Then switch to a rubber spatula and scoop out the dough onto a floured work surface, getting all the dough from the bowl. You will need a bench scraper at this point so go get one ready! 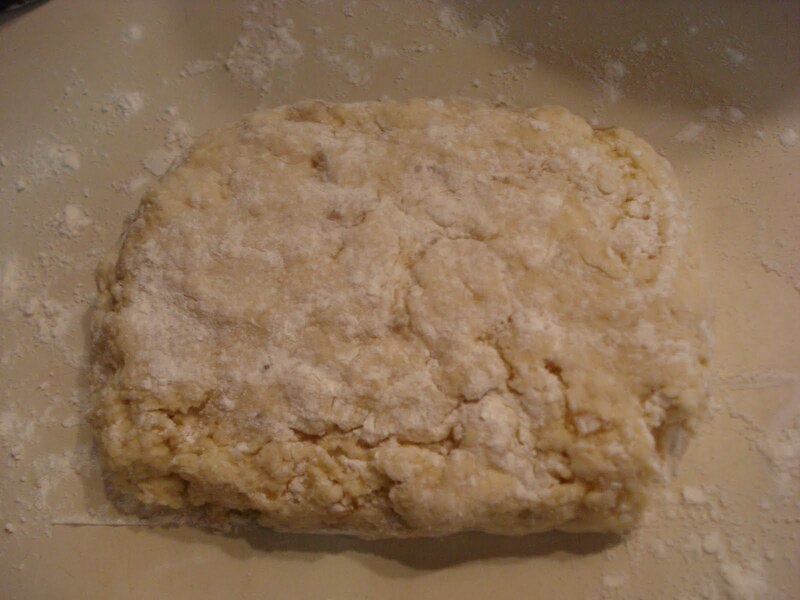 Flour your hands and the bench scraper and form the dough into a rectangle. Cut the rectangle into 3 pieces all the same size. 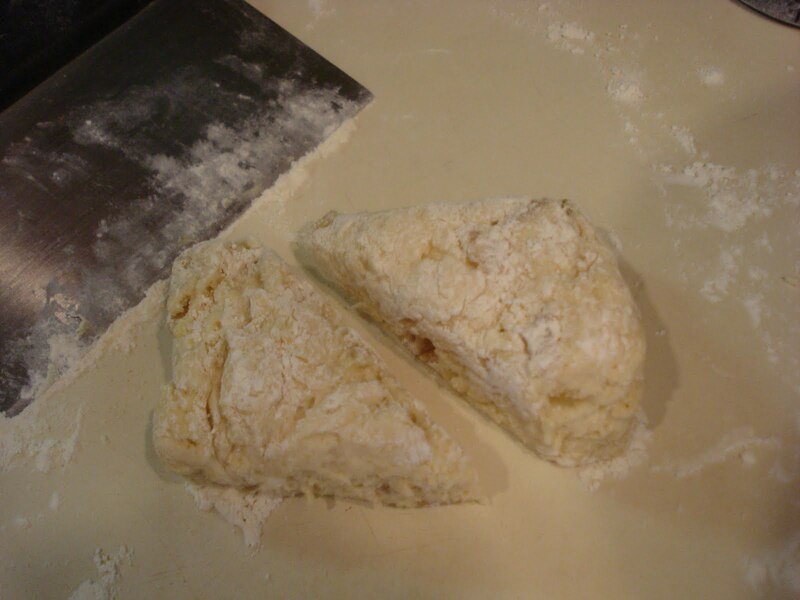 You'll need to reflour the scraper as you cut. Then cut each piece in half diagonally to form a triangle shape. Flouring the scraper once more, scoop up the triangle and place it onto the parchment paper lined baking sheet. 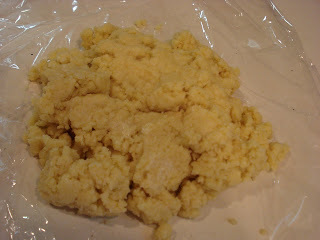 ( This is where I take the dough and place it onto a piece of waxed paper to freeze. Once it's frozen, I transfer it to a zip lock bag for later baking. And there's no need to thaw the dough. It can just go from the freezer straight into the oven. You can place the topping onto the frozen scone just before baking). If you're baking all the scones right away proceed with the topping. 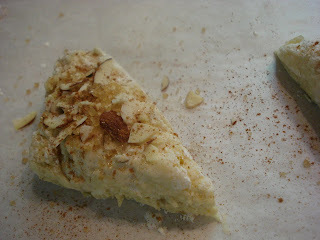 Brush the tops with a little milk or half and half ( if you have it) and sprinkle the almond slices on top, crushing them just a bit. Then sprinkle with a little raw sugar, then a little cinnamon...and pop them into the oven...finally! Bake them for about 15 minutes or til they get a nice light golden color. Preheat oven to 400 and set rack to middle position. Line a baking sheet with parchment paper. 1. Combine flour, sugar, baking powder, salt and ground ginger in the bowl of a food porcessor fitted with a metal blade. Pulse several times to mix. 2. Add the cold butter pieces and pulse til butter is in smaller pieces. 3. Transfer mixture to a large mixing bowl. 4. Add the crystallized ginger and mix gently. 5. In a small bowl, mix the milk and eggs, then add to the dough. Mix gently with a fork, referring to my notes and photos above. (I did need to add more milk. if yours seems too dry, add more milk a tablespoon at a time and gently mixing with the fork.) Don't overmix the dough! 6. Switching to a rubber spatula, scoop out the dough onto a floured work surface. 7. Using a bench scraper, well floured, form the dough into a rectangle and cut into 3 same size pieces. Then cut these 3 pieces diagonally into triangles, reflouring the scraper each time you make a cut. 8. Place the triangles onto the baking sheet, spacing 2" apart. 9. Brush the tops with a little milk or half and half. Sprinkle with the sliced almonds, crushing them slightly, then sprinkle with a little raw sugar and finally some cinnamon. 10. Bake for approx. 15 minutes or til lightly browned. 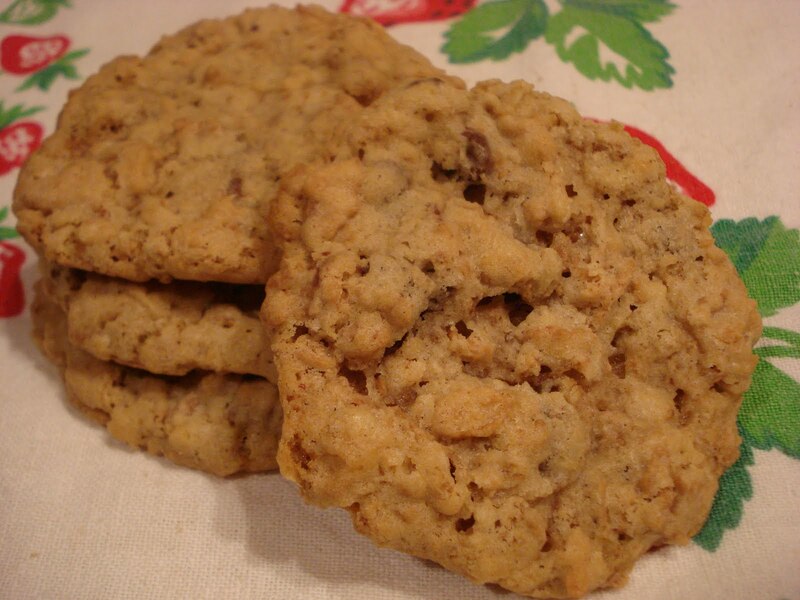 Ranger cookies have been around for a long time and as far as I can tell no one actually knows how the cookies got their name. My guess would be something to do with the Lone Ranger. General Mills, which produces Cheerios cereal, came out in 1947 with a line of Frontier Town cereal boxes with the Lone Ranger likeness. Different versions of the boxes would have different Frontier Town buildings on the back of the box. Kids would collect them and cut out the buildings. Maybe they created a cookie in his honor, made with Cheerios! This recipe comes from King Arthur Flour. 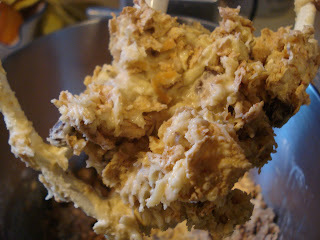 I halved the recipe and used some generic sweetened flake cereal I had but you could use a crispy rice cereal or cornflakes. I liked the cookie and the chocolate chips in the cookie was a good addition. I would actually use more next time. The cereal gave it a nice crunch and I chose to use toasted coconut which also helped add to the crunch. My only objection was it needed more flavor. It was a little bland with no flavor punch. Maybe using more chocolate chips would help or maybe using dark brown sugar as I used light brown. Or if you really like coconut, using coconut extract might add ..something? Place the butter, sugars, vanilla and salt in a mixer bowl and beat til fluffy. Add the eggs and beat til smooth. 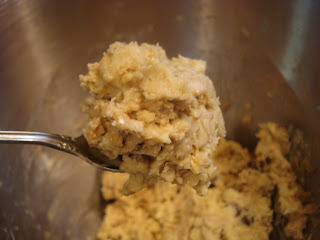 After mixing the dry ingredients in a separate bowl, add them to the dough and beat til combined. Then stir in the oats, coconut, chips and cereal til just blended. The mixture will be very chunky. Scoop rounded teaspoonfuls ( Mine were very generous teaspoonfuls) onto your prepared baking sheet. Space them about 3" apart because they will spread. They flatten out but get nice and crunchy and once they cool, they remain firm. 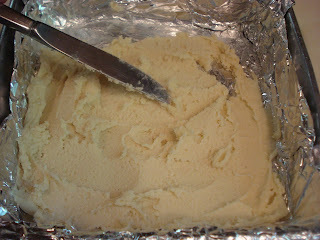 1.Place butter, sugars, vanilla and salt in a mixer bowl and beat til fluffy. 2. Add eggs, one at a time, til smooth. 3. 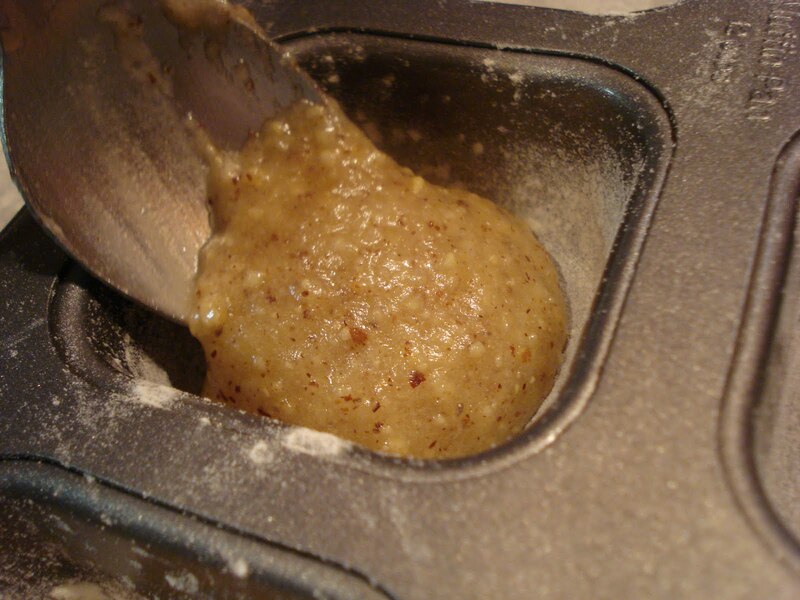 In a small bowl, mix flour, baking powder and baking soda and add to butter mixture, beating til incorporated. 4. Stir in oats, coconut, chocolate chips and cereal til just blended. 5. Drop by rounded tespoonfuls spacing about 3" apart. 6. Bake til golden, about 12 to 14 minutes. 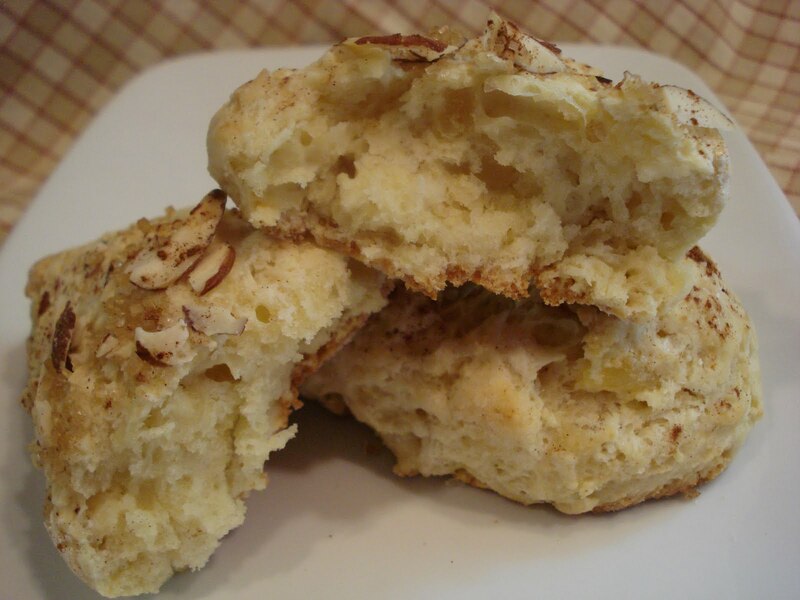 Today I chose another recipe from Nick Malgieri's book, "The Modern Baker". I decided to go with a bar recipe this time. 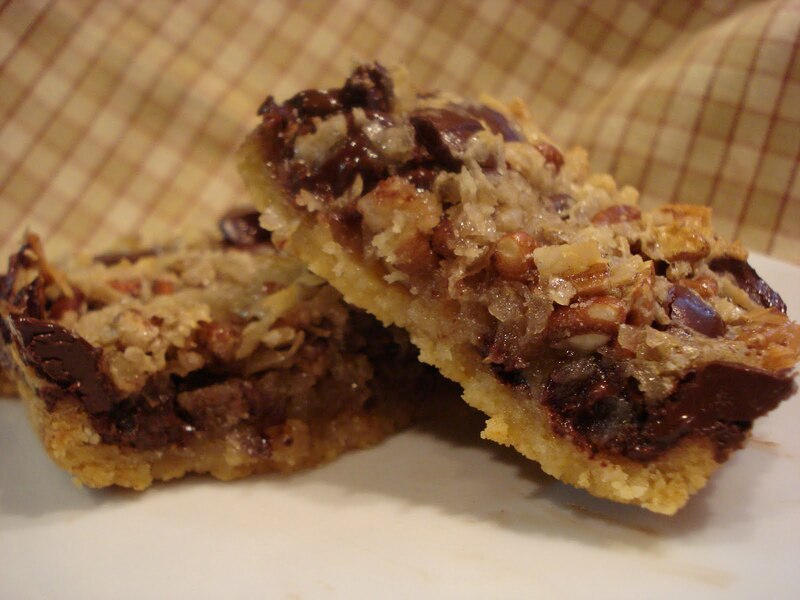 This cookie bar is gooey, chewy and really quite rich! It wasn't the smartest choice for a hot summer day but as long as you keep it in the fridge, it will stay firm. In this heat, everything melts so fast! Guess by now you can figure out I don't have an air conditioned kitchen! The chocolate in the bars starts to melt the second I take it out of the fridge. I actually had to pop the bars in the freezer to get them hard enough to photograph them..quickly! If you don't like coconut, I think just leaving it out would be fine. The original recipe also called for bittersweet chocolate chunks, which I didn't have so I just used bittersweet chips and that worked out fine, too. 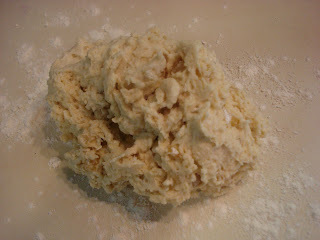 To start, make the dough for the base by combining the dry ingredients and set aside. Then in a mixer bowl, beat the butter and sugar 2-3 minutes. Then with the mixer on low speed, beat in the dry ingredients til the dough is smooth. Scoop the dough into your prepared pan and spread it out evenly with a knife, then use your fingers to smooth it out and get it in the corners. ( He says to press the dough down using the palms of your hands! I say ?? I don't quite get how you could do this!). Anyway, then bake it for about 15 to 18 minutes. While the base is baking, make the topping by placing the brown sugar in a medium bowl and mix in the eggs with a rubber spatula. 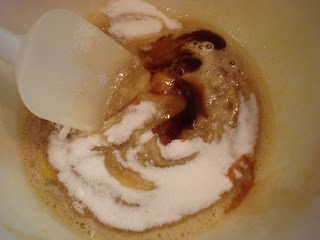 Then stir in the granulated sugar and vanilla. 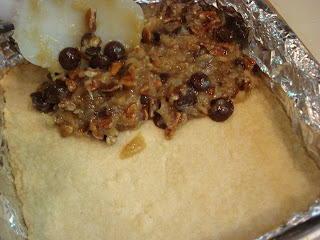 Fold in the coconut, pecans and chopped chocolate ( or chocolate chips). Once the base comes out of the oven, set it on a wire rack. Let it cool about 10 minutes. Spoon the topping on and spread it out over the base. Then pop it back into the oven for another 20 - 25 minutes. Preheat oven to 350. Line a 9 x 13 x 2 inch pan with parchment or foil and butter bottom and sides. Allow extra foil for overhang to lift out bars once baked. Set rack in the lowest level of the oven. 1. Dough: Stir together flour, baking powder, salt and set aside. 2. 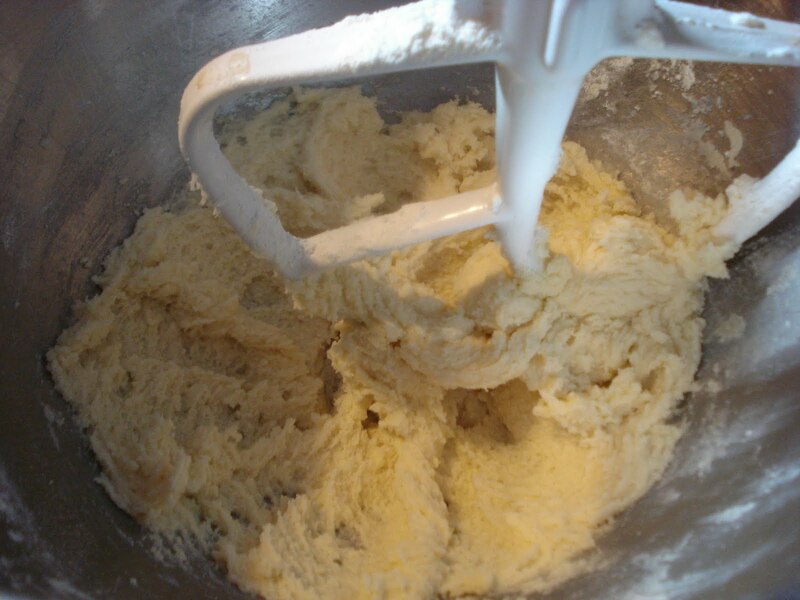 In a mixer bowl, beat butter with the sugar on medium speed til soft and light, 2-3 minutes. 3. 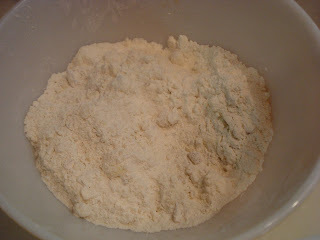 On the lowest speed, beat in the flour mixture, scraping the bowl, til the dough is smooth. 4. Spoon the mixture into the prepared pan and spread it out with a knife or spatula, then press very lightly with your fingers to get into the corners. 5. Bake approx. 15 minutes, ( mine took a few minutes longer), til puffed and set and beginning to color. 6. Set the pan on a rack and let it cool while you make the topping ( if you've already made the topping, still let it cool about 10 minutes. Do the dishes..or something!). 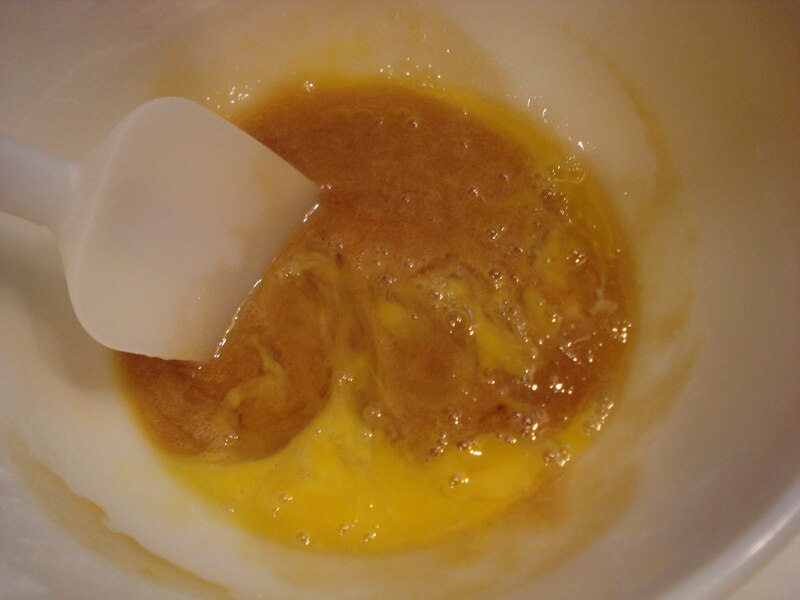 1.Place the brown sugar in a large bowl and use a large rubber spatula to work in the eggs, one at a time, stirring til smooth after each. 2. 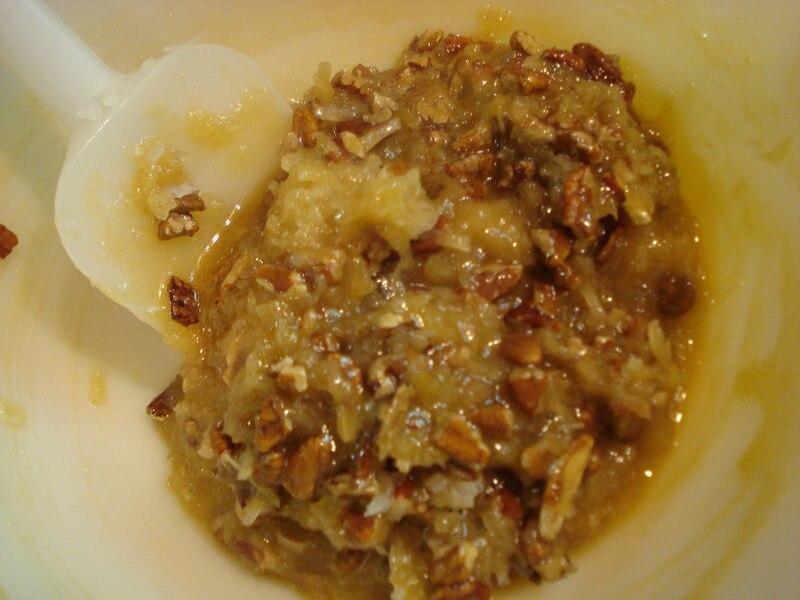 Stir in the granulated sugar and vanilla, then fold in the coconut and pecans. 4. Spoon the topping onto the prebaked dough and spread evenly over the top. 5. Bake til the filling is set and nicely colored, about 20 to 25 minutes. ( Mine took a little longer). 6. Cool in the pan on a rack. Lift the bar onto a cutting board before it has cooled completely. 7. Cut into 2" squares..oops! I cut mine way bigger! Because it's so rich, 2" squares is really a good idea! As I stated above, I kept mine in the fridge. The book says to keep at room temp. if your serving them within a day. If not, wrap and freeze and bring to room temp. before serving them (which would take about 2 minutes in my kitchen!) Enjoy!